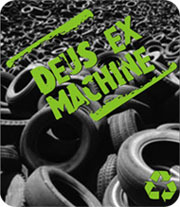 Deus Ex Machine ships all over the world. Shipping can take from 2 to 3 days depending on destination. As soon as your order is dispatched, you will receive an email confirmation and a tracking number by e-mail. Recycled inner tube and banner. Size: 11 x 9 cm.